Hot electrons; biologically inspired materials; photonic-crystal-enhanced quantum dots. By splitting water molecules, Rice University researchers have demonstrated what they say is an efficient way to capture energy from the sun and convert it into clean, renewable energy. 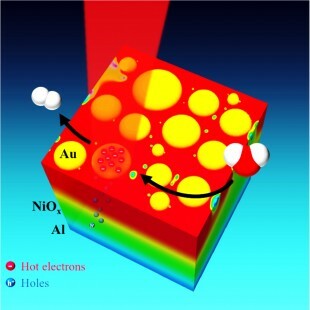 The technology relies on a configuration of light-activated gold nanoparticles that harvest sunlight and transfer solar energy to highly excited electrons, which scientists sometimes refer to as “hot electrons,” which have the potential to drive very useful chemical reactions, but also decay very rapidly. As such, it has been a struggle to harness their energy, the researchers explained. “For example, most of the energy losses in today’s best photovoltaic solar panels are the result of hot electrons that cool within a few trillionths of a second and release their energy as wasted heat,” according to Isabell Thomann, head researcher on the project and assistant professor of electrical and computer engineering and of chemistry and materials science and nanoengineering at Rice. Capturing the high-energy electrons before they cool could allow solar-energy providers to significantly increase their solar-to-electric power-conversion efficiencies and meet a national goal of reducing the cost of solar electricity, the researchers pointed out. In the light-activated nanoparticles studied by Thomann and team, light is captured and converted into plasmons, waves of electrons that flow like a fluid across the metal surface of the nanoparticles. Plasmons are high-energy states that are short-lived, but researchers at Rice and elsewhere have found ways to capture plasmonic energy and convert it into useful heat or light. Plasmonic nanoparticles also offer one of the most promising means of harnessing the power of hot electrons. The researchers created a system that uses the energy from hot electrons to split molecules of water into oxygen and hydrogen, which is important because oxygen and hydrogen are the feedstocks for fuel cells, electrochemical devices that produce electricity cleanly and efficiently. In an example of work with biologically-inspired materials, researchers at MIT have developed a family of materials that can emit light of precisely controlled colors — even pure white light — and whose output can be tuned to respond to a wide variety of external conditions. The researchers expect the materials to have a variety of uses in detecting chemical and biological compounds, or mechanical and thermal conditions. The material is a metallic polymer gel made using rare-earth elements, the researchers said. This light-emitting lanthanide metallogel can be chemically tuned to emit light in response to chemical, mechanical, or thermal stimuli — potentially providing a visible output to indicate the presence of a particular substance or condition. The new material is an example of work with biologically inspired materials, such as biomimetics — using nature’s tricks to design bio-inspired polymers. Studying such natural materials, evolved over millions of years to adapt to challenging environmental conditions, allows engineers to derive design principles that can be applied to other kinds of materials. The research in this area has uncovered a particular kind of crosslinking in the threads mussels use to anchor themselves to rocks, called metal-coordination bonds. These also play an important role in many biological functions, such as binding oxygen to hemoglobin in red blood cells. The idea is not to copy nature, but to understand and apply some of the underlying principles of natural materials; in some cases, these principles can be applied in materials that are simpler in structure and easier to produce than their natural counterparts. 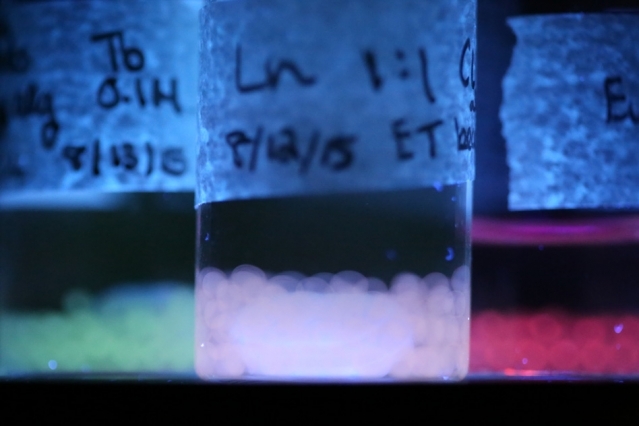 Luminescent materials produced by the MIT team are shown under ultraviolet light, emitting different colors of light that can be modified by their environmental conditions. These light-emitting beads were made by materials science and engineering students Caroline Liu and Rebecca Gallivan. In this case, the use of a metal from the lanthanide group, also known as rare-earth elements, combined with a widely used polymer called polyethylene glycol, or PEG, results in a material that produces tunable, multicolored light emissions. The light emission can then reflect very subtle changes in the environment, providing a color-coded output that reveals details of those conditions. Quantum dots (QDs) have moved from the research lab into commercial products such as high-end TVs, e-readers, laptops, and even some LED lighting but as they are expensive to make, there’s a push to improve their performance and efficiency while lowering their fabrication costs. To this end, University of Illinois researchers recently produced some promising results toward that goal, and have developed a method to extract more efficient and polarized light from quantum dots over a large-scale area. Their method combines quantum dots and photonic crystal technology, and could lead to brighter and more efficient mobile phone, tablet, and computer displays, as well as enhanced LED lighting. The researchers embedded quantum dots in novel polymer materials that retain strong quantum efficiency. They used electrohydrodynamic jet (e-jet) printing technology to precisely print the QD-embedded polymers onto photonic crystal structures. This precision eliminates wasted QDs, which are expensive to make, they said. These photonic crystals limit the direction that the QD-generated light is emitted, meaning they produce polarized light, which is more intense than normal QD light output. The replica molded photonic crystals could someday lead to brighter, less expensive, and more efficient displays, the researchers concluded.